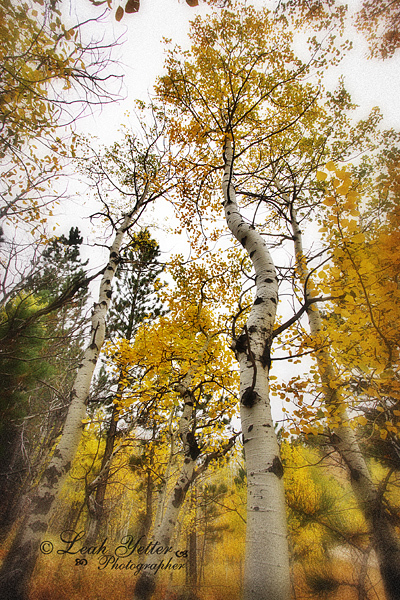 I’ve shared my love of Quaking Aspens with you before, and today I’d like to do that again. These trees are so beautiful especially in the fall. 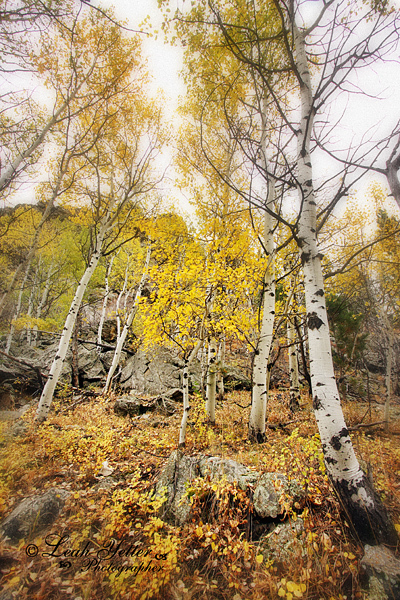 Their leaves turn to gold like the Cottonwood, but the contrast with the white trunks makes them pop from rocks and other trees. In this little quakie forest I stumbled into, one side was chaotic with tangled limbs and leaves that have fallen all over the buck brush. And in the other direction, the leaves were still pretty much in tact on the limbs and the green grass provided the contrast with the white trunks. Another tidbit about the trunks- they look like they have eyes. I’ll pull some shots of them that I captured last winter where it really shows the “eyeballs” in the trunks and post them for you. They are really cool! I hope you are having a falltastic Monday! The Quaking Aspens are beautiful today. We had a very light rain last night so this morning I went for a drive to hunt them. And I found them. It was overcast but the extra moisture made them sparkle. I love fall and I know there is a fleeting glimpse of color and tolerable temperatures before we are blanketed in snow. I’ll be chasing quakies and cottonwoods until I can chase no longer.